If you are interested in sports, this list is brought to you, we are going to list to you the top ten most popular sports in the world according to recent studies, most popular sports can be ranked according to watching rate, practicing rate or even the most revenue generating ones, but on this list we will focus more on the most watched sports so read on. Golf comes on the tenth position of the rank, it is a ball game where players compete together using many clubs to hit the ball into a series of holes, the idea is to use fewer and successful strikes to score, Gold has an estimated 390 million fans in the USA, Canada and Europe. With estimated 410 million fans in the USA, the American football or also known as gridiron comes in the 9th place on the list, American football is quit different than the regular football, in this game two teams of eleven players are competing on a field 120 yards long and 53 yards wide to score an oval ball down the field by running it or passing it to the same team players. With over 500 million fans for baseball around the world and mainly in the USA, Cuba, Japan and Dominican republic baseball comes as the 8th most popular game in the world. Baseball is a game played between two teams consisting of nine player each team who take turns batting the ball with a bat and fielding. Table tennis or also known as ping pong comes the 7th most popular game in the world with about 900 million fans in the USA, Asia, and Africa, it is a game where two or four players hit a ball with ping pong rackets back and forth, players must allow the ball to bounce once on each side to score. 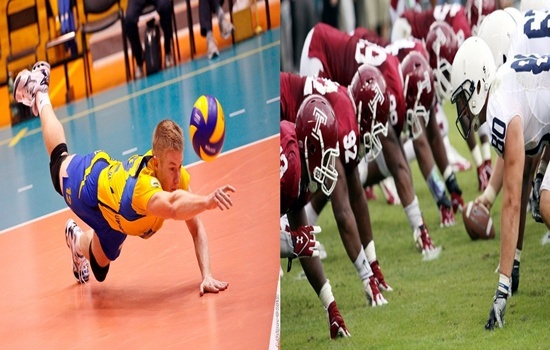 Volleyball comes the 6th on the list with about 950 million fans around Europe, Australia, Asia and the Americas , volleyball is a game that occur between two teams of six players each separated by a net, each team tries to ground a ball in the other team’s course in order to score. With over one billion fans in the Americas, Asia and Europe , tennis comes as the fifth most popular game in the world, tennis is a game that can be played by two players or two teams consisting to two players each, using a racket and a hallow rubber ball, to make a score you should make a strike that the opponent player can not return. Hokey comes as the fourth most popular game on earth with about 2.2 billion fans in Europe , Asia , Africa and the Americas. Hokey can be played on ice or field where two teams try to score the ball into the oponent team goal using a hokey stick. With about 2.3 billion fans around the world but mainly in USA, Canada and China , Basketball comes as the third most popular game in the world, Basketball is a game played between two teams of five players each on a rectangular court and try to pass the ball through the hoop about 46 cm and ten feet high. Cricket comes as the second most popular game in the world with about 2.4 fans in the USA, Pakistan, Canada, Asia, India and Australia, the game is played by two teams of 11 players each on 22 yards long field using a bat and a ball, each team take turns to bat the ball trying to score runs while the other team field. With no doubt, soccer or commonly known as football holds the top position on the list with over 3.5 billion fans world wide, its played by 250 million players in 200 countries, in football two teams consisting of 11 players each compete on a rectangular field with a goal on each end of the field, players should score goals by any part of the body other than the hands and arms in the opposite team goal.